Upon the announcement of the 2015 Youth Ink writing contest , co-chairs Elizabeth Casey and Leigh Colburn talked with the Orinda News. Read their story online in the Orinda News (on page 15). 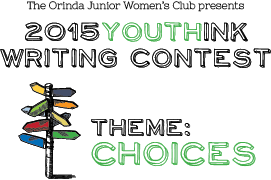 The 2015 Youth Ink writing contest is open to middle school students, grades 6th, 7th and 8th, who live in or attend an Orinda school. Entries may be a story (fiction or non-fiction), poem, or other form of creative writing, written specifically for the contest. The writing prompt for 2015 is Choices; however, you may write about anything you like—real or imaginary—adhere to the prompt or not! There is no limit to your imagination.